The 41st player was just eliminated from the $600 NLHE event and all 40 remaining players are now guaranteed at least $1,248. Of the 357 players that started the $600 NLHE event today, only 54 remain. The blinds are currently 1,000-2,000 with a 200 ante and the average chip stack is just over 66,000. The top 40 players will finish in the money. We had a total of 168 players in the $400 Omaha High/Low Eight or Better event at the Foxwoods World Poker Finals. The final 20 spots will finish in the money. Kris Riskin Wins the $500 NLHE Event! In less than six hours of play, the final 15 in the $500 N0-Limit Hold 'em event at the Foxwoods World Poker Finals have played down to a winner. In the end, Kris Riskin took the trophy, leather jacket and the $34,610 first place prize! $400 Omaha H/L 8/O Event Underway! The $400 Omaha High/Low Eight or Better event is now underway. 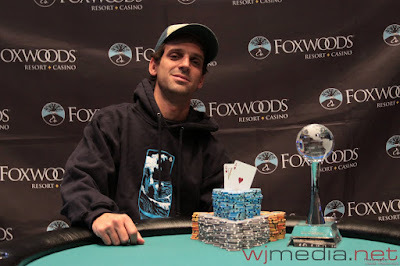 We had a total of 357 players in the $600 NLHE event at the Foxwoods World Poker Finals. The final 40 spots will finish in the money. We are down to the final table of the $500 NLHE Event.. The blinds are 6,000-12,000 with a 1,500 ante. Day Two of the $500 NLHE event is set to get underway at noon. Of the 340 players who started the event, 15 moved on to today's action. $600 NLHE Hold 'em Event Underway! The $600 No-Limit Hold 'em event at the Foxwoods World Poker Finals is underway with over 300 players already registered. Players started with 10,000 in chips and the levels are 50 minutes in length.